Amanda Pottinger and Just Kidding. Photo courtesy of the Australian International Three-Day Event. 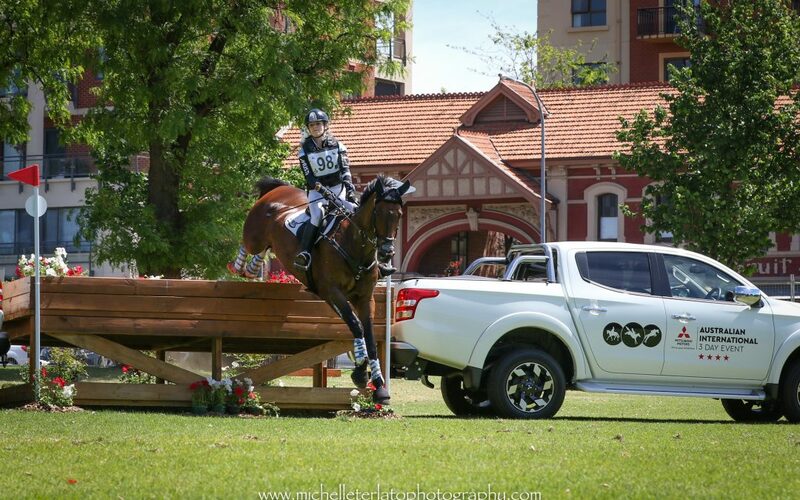 Amanda Pottinger and Just Kidding lead the Adelaide CCI4*after an exciting and somewhat controversial cross country day at the Australian International Three-Day Event. 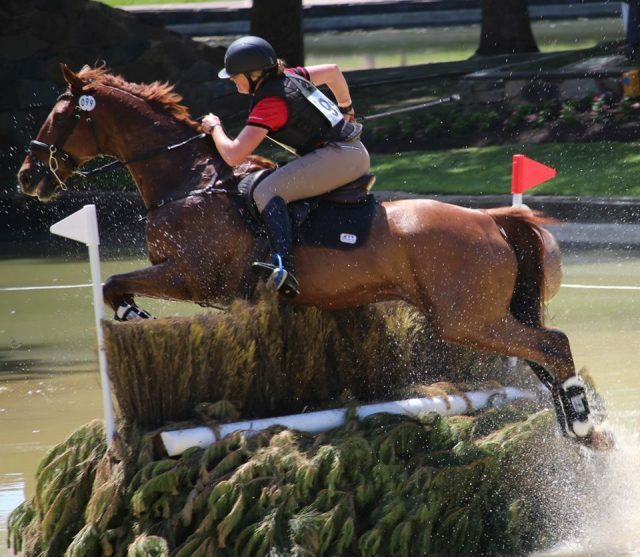 Coming off the course, Amanda and the 12-year-old Thoroughbred (Fusaichi Pegasus x Gypsy Princess, by Sadler’s Wells) had 50 penalty points added to their score for jumping outside of the flag on fence 9C, a brush corner, according to a report from New Zealand Horse & Pony. Second-placed Hazel Shannon was also given the same penalty at the same fence. After reviewing video, the Ground Jury ultimately decided to remove the penalties for both riders giving us a sense of déjà vu after last year’s penalty controversy. Four-star debutants, Amanda and “Ferg,” who is owned by the Pottinger Family, were in 8th place yesterday after scoring a 34.8 on the flat. The kiwi pair picked up 12.4 time penalties to go (almost) straight to the top as the second fastest of the day. They carry a score of 47.2 into the final phase. Hazel Shannon and Willingapark Clifford. Photo courtesy of the Australian International Three-Day Event. 2016 winners Hazel Shannon and Willingapark Clifford, a 13-year-old Thoroughbred owned by Terrence Snow, are looking confident in second place on a current score of 51.5. They added 17.6 time penalties around Mike Etherington-Smith’s track to move up from fifth. Emily Gray and Jocular Vision. Photo courtesy of the Australian International Three-Day Event. 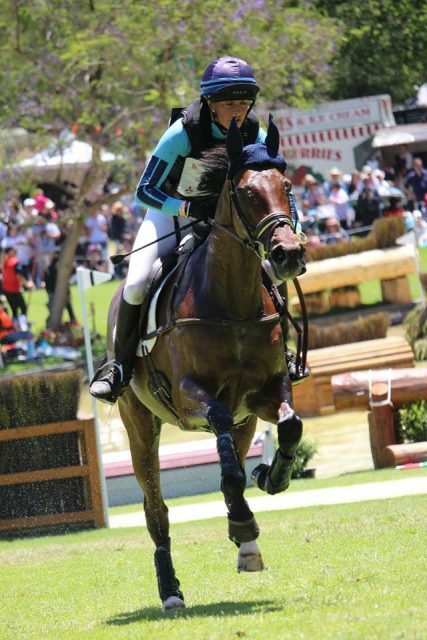 Though they didn’t finish the day in the very top spot, Emily Gray and Jocular Vision, a 14-year old Warmblood/Thoroughbred (Jubliee Bay x Pocohontas, by Domingo) made the incredible leap from last place to the top three after a challenging cross country test. They were the very fastest pair of the bunch in 11 minutes and 51 seconds for a two-day result of 67.3. Mike Etherington-Smith’s track received rave reviews from competitors and fans. If you missed it, check out a fly-by at this link. Only half of the 24 starters finished. None finished within the time, but Emily Gray was the closest to the optimum time of 11 minutes 27 seconds.